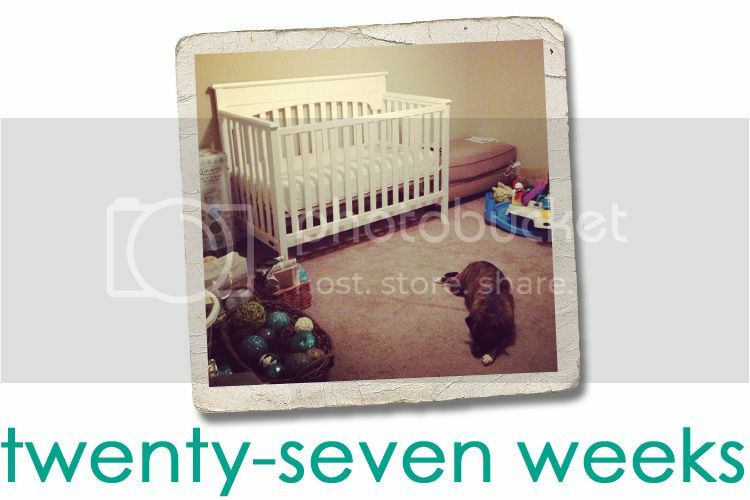 Jordy Liz Blogs: Twenty-seven weeks. This is the last week of our second trimester; can you believe we're almost in the last stretch? Your dad put your crib together the other night. It is such a relief to know that one big thing is checked off the list. If it was anything other than a crib, I think it would have required a little more prodding by me to get him to stay up until 11 p.m. putting pieces of furniture together. But because it's for you, it didn't take much prodding at all. Your sister-dog, Mia, never left his side and he was quite proud of himself in the end. Your Type-A mother is just glad the list of to-do's is being accomplished - slowly, but surely. Speaking of Mia, I think she knows something. She didn't want to leave your room after the crib was built. She's claimed the space. I can't wait to see how the two of you become instant friends. I am still pretty uncomfortable and I am just chalking it up to being pregnant. The last few months have been bliss; barely any symptoms crept into my second trimester and I had to often remind myself I was actually pregnant. As we near the third, that isn't quite the case. I just can't seem to get comfortable enough for my back to stop aching, so I just get used to it and know it's all for you. However, I will not decline a massage, should anyone offer. A third pillow has been added to my sleeping collection: one for my arms and stomach has been added to the one for my head and one for my legs. I've slept much better the last few nights with the addition and I seem to get more comfortable faster. That is until around 4 a.m. when the bathroom calls my name. It's been a fun journey so far and I am thankful for the last two-thirds of it.